Absorbs pollution. Can be chopped down for wood. 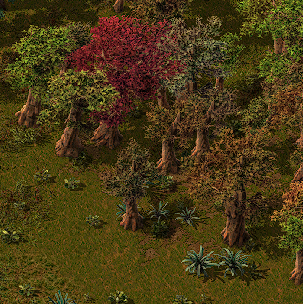 Trees are plants in Factorio. They can be mined for wood, and are the only source of it. Trees are obstacles to construction and must be cleared to provide building space, but they also reduce pollution, so take care not to remove more than necessary. Currently, trees cannot be replanted. (*) Usable to collect wood. Dead trees will give 2 wood and have a mining time of 0.5. Live trees will give 4 wood and have a mining time of 0.55. All other methods just destroy the tree and wood. A forest fire spreads rapidly after a few moments. Trees can be set on fire by flamethrowers and flamethrower turrets. The fire will spread from tree to tree, releasing high amounts of pollution and leaving stumps and charred trees behind. Once on fire, trees cannot be extinguished, but the spread of the fire can be limited by creating a fire break. Every single tree absorbs a small amount of pollution in its chunk per second. If the total pollution in that chunk is above 60 units, trees lose their leaves for every 10 pollution absorbed. The less dense the leaves, the slower the tree absorbs pollution.